As a new user, we know that there is a lot to learn. So we are providing this "Getting Started" guide as a quick reference to help with the learning curve. Please let us know if you have any suggestions to improve this guide. 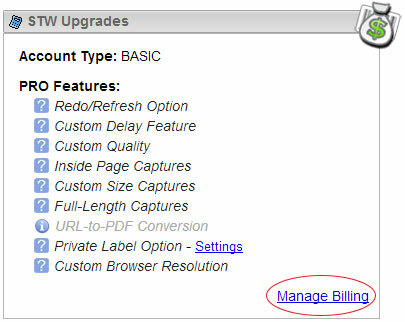 Existing orders and payment methods may be managed by clicking the "Manage Subscriptions & Billing" link in the STW Upgrades section of the dashboard. Note: You do not need to upgrade bandwidth or new requests right away. The system will notify you, as you approach your limits. Those notifications will attempt to predict what usage you will need, based on usage, to choose when upgrading.